Give your ensemble that unexpected, totally luxe bit of pop with this snakeskin-printed calf-hair belt finished in golden hardware. This fabulous fashion accessory is produced by Top Shop. Unquestionably Britain's most famous high-street brand, Topshop consistently delivers affordable, just-right pieces that reflect seasonal runway and street trends from around the world. Founded in 1964 in the basement of a department store, Topshop has evolved into a global trendsetter complete with elevated capsule collections Unique and Boutique, plus special collaborations. 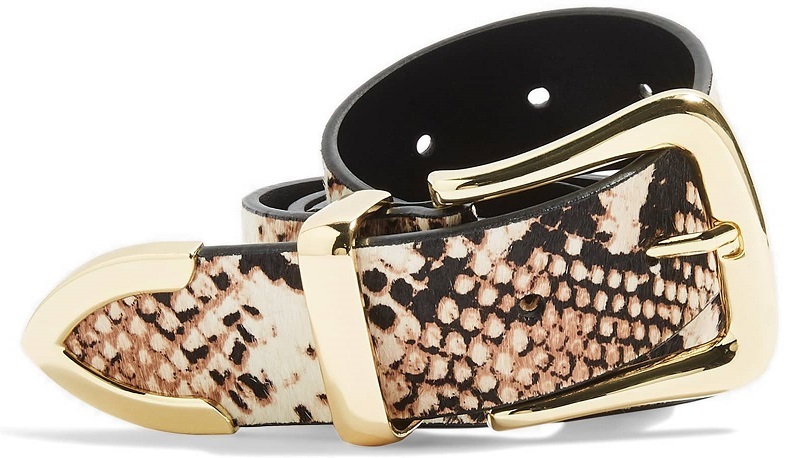 This fantastic snake skin print belt is available at Nordstrom while supplies last. Search for the "Snake Print Genuine Calf Hair & Leather Belt" by Top Shop. Learn more about women's belts here on Apparel Search.